Where did the month go? LOL Between holiday plans, a small cold, and the name servers losing my site for a few days I’ve ghosted through most of November. The Pokedex challenge fell to the wayside along with all the other challenges. My hope that I’d manage four freehand looks this month? Pretty much dashed. Plus I’d intended to use the month to finish up my recreations from last year’s #nailfails, but it looks like they’ll be bleeding into December. Well, I’ve finished one at least! 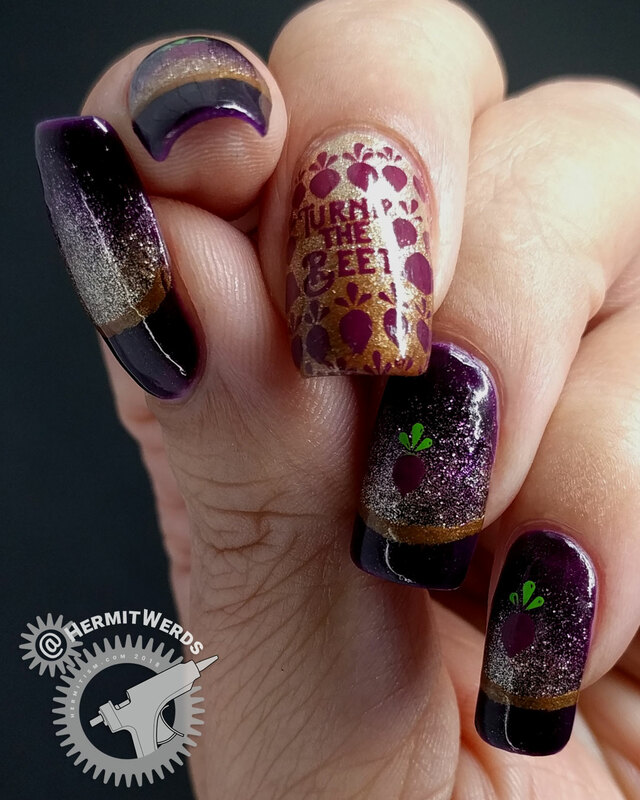 How many nail artists can say they have painted beets on their nails twice? 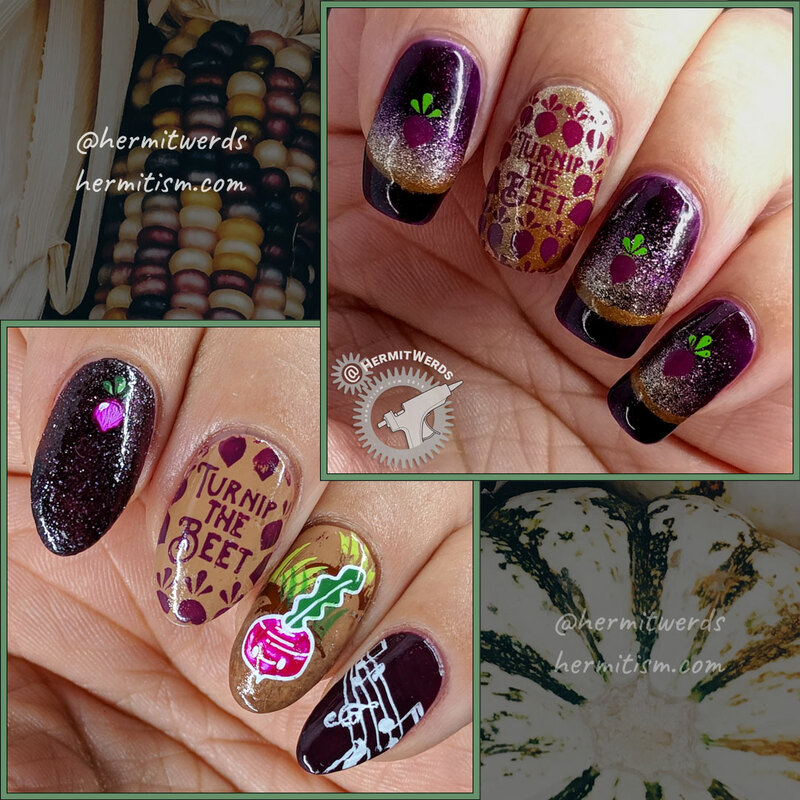 The problem with the original nail art is that I was both trying to use Uber Chic’s Farm Fresh stamping plate so I could cross it off the unused list while trying to throw in too many other elements. The combination of kawaii beets and stylized beets plus musical notes and planting things on the faaaarm with no hierarchy of importance in any of the subjects just turned into chaos. It was too much of too much so recreating this meant dropping elements and focusing on what I liked most. 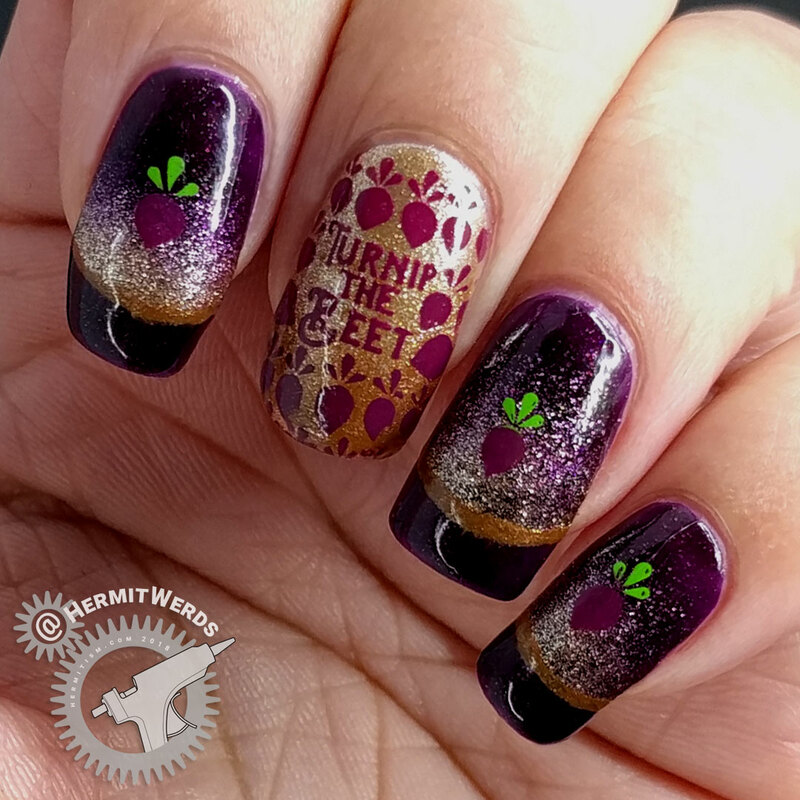 I decided to keep the reddish purple color and stylized beets and regroup around the pun. Instead of using a lot of brown that I wasn’t excited about, I added gold and a golden brown. I did like the little pops of green, but that grass did not stamp well since the polishes weren’t opaque enough. Instead I used both colors when I stamped and scraped carefully to keep them from mixing too much. 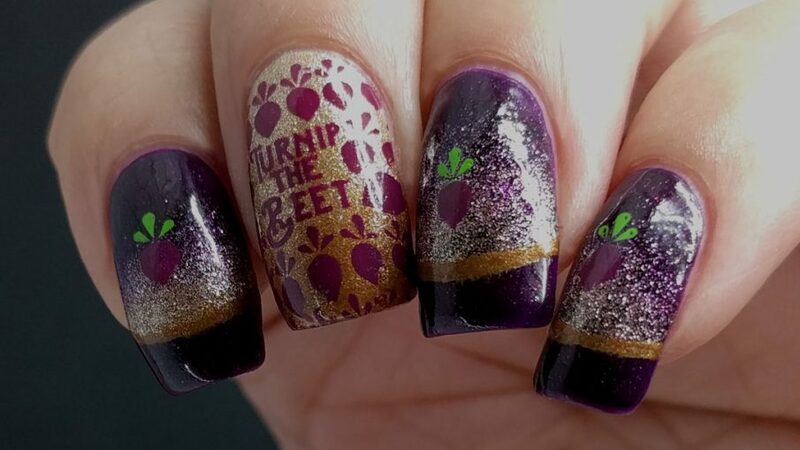 Initially I was going to make the french tip gold and make it represent the ground by “planting” the beets in it with the greens on top sticking out. It ended up looking odd when I tried it. So instead I reversed where the gold would be and just let the beets be centered in that space. French tip gradient created with french tip stickers and Bee’s Knees Lacquer’s “Friend From Work” + Covergirl’s “Golden Opportunity” and then outlined freehand with Covergirl’s “Espresso”. I didn’t even take a photo where you can see the holo too. I’m fired. Or was that a kindness because the polish is no longer available? I do prefer my french tips to be a lighter color at the tip and a darker (in comparison) color on rest of the nail so I was going against my natural grain. And I was so excited about how pretty the base polish was that I hesitated to cover it up too much with the gold gradient. I think it would have benefited if I’d let a little bit of gold be all over anything that wasn’t the tips. Edit 12/1/2018: So I’m an idiot. I do prefer darker tips and a lighter center. The problem is that because I didn’t cover the entire space with at least a little gold, the tip wasn’t darker than the rest of the nail because there was still a part of it that was the same color. So I could have done it better. But this is definitely an improvement and the beets are super cute. I am satisfied.